I wanted to wait a bit to write about this to make sure it was really happening. Sarah has been a little ornery during nap times recently. In the past she played for about 20 minutes and then would fall asleep. Recently it's been about 90 minutes or more. We try not to go in her room during nap time but when she's being ridiculous one of us will go in and reset her, retuck her in, and take away whatever she's playing with. Saturday was a pretty rough day. We had already taken all her toys away and Chris could still hear her in there being loud. So he went in and discovered that she had been really naughty. In her boredom and fighting nap time, she chewed her paci nib off. Chris was so mad! He took it away and came into the kitchen and was about to throw it away and told me in a very stern voice, "No More Paci!" I looked down and saw what he's holding. Yep, no more paci. I think he was more worried than angry. What if she swallowed the nib? So he told her she broke it and she couldn't have her paci anymore. She cried...a lot. I went in there and asked what was wrong and you could see it all over her face. But she understood well enough that she knew not to ask for her paci. Bed time wasn't any better. I heard her explaining to all her stuffed animals that paci is broken. When I went in to reset her she was crying and I asked her what was wrong. She said, "it's broken." So I asked her, "what's broken?" She knew not to ask for her paci so she said, "my blanket". So I "fixed it" by tucking her back in. Sunday at nap time she asked for paci. And I told her "paci's broken remember" she looked at me and said "pink paci. It's right there." as she pointed to the cabinet where her back up paci is. I said, you can't have a paci because you broke yours. 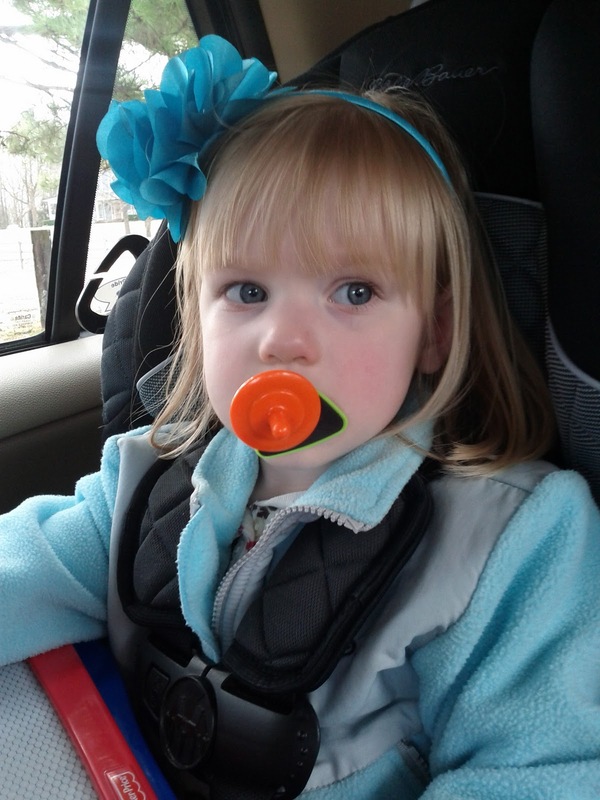 Then I went and got the blue paci and showed her to remind her what she did. It took a while for her to fall asleep, but she eventually did. And slowly it's been getting a little bit easier each time she's gone to bed. Monday it only took about 40 minutes for her to fall asleep at nap time. I wasn't planning on taking her paci away anytime soon. Honestly since she kept it to only in her bed I didn't care that she had it. However, Chris is right with his decision because of the situation and since she understands exactly what happened it seems like this is a good time to break. But something tells me she's not quite over it yet. But on the bright side, she is wearing an adorable head band!! Chris was right. How scary to think she could have choked on the nib. Yikes!